We started the day off leaving Jerusalem and driving to Nablus to visit Jacob’s Well. 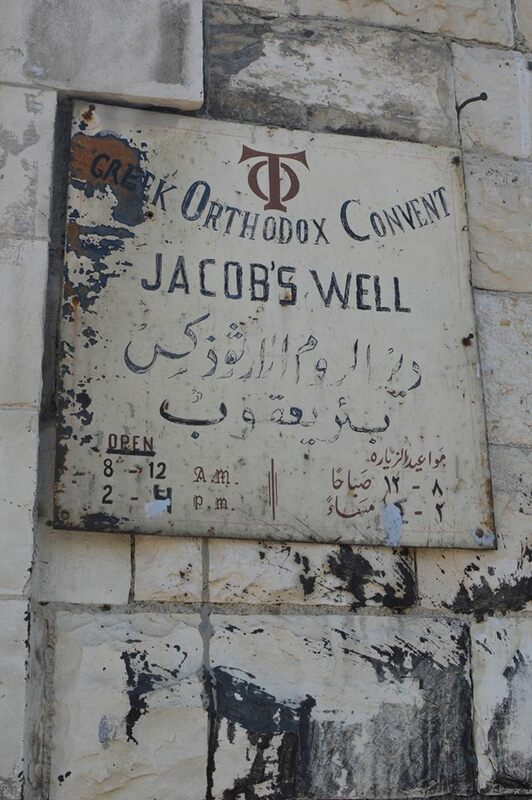 Jacob’s Well is significant in Christianity for the story of the woman at the well where Jesus asks a Samaritan woman for water. The Greek Orthodox church built around Jacob’s Well was a beautiful place surrounded by trees and flowers with cats sleeping in the shade. Although the church was a Holy place to allow for people to mediate and pray, it was also a place full of tension. While the church was Greek Orthodox, there have been several Jewish activists protesting the church and wanting to turn it into a Jewish holy site. As we have traveled around to different Holy sites, we have often found ourselves learning of the many conflicts that occur in churches, synagogues, and mosques between different religious groups. In a place of worship and prayer there are too many stories of violence and death. A significant part of this trip has been realizing that there is still much to be done in the church. A church cannot be a church if it is built upon the backs of those oppressed, discriminated and denied entrance. As Disciples, we are called to push pass the obstacles to let those who are on the outside in. We must push past our differences to create unity and foster peace. As we walked into the church the first thing we noticed was the colorful chandeliers and the grand image of Jesus and angels across the ceiling. Walking down a flight of stairs, we found ourselves in a cave-like room with the Well located in the front. I was amazed to learn that the Well was 140 feet deep and we were able to watch our tour guide drop a bucket to draw up fresh water. As we all huddled around the well, a cup full of water from the Well was passed around and we all were able to take turns taking a sip. During the debrief at the end of the day, one of our group members, Yvette, talked about how in that moment she truly felt the bond and community as we passed around a cup for us to share. I completely agree with her. In that instance, our differences and backgrounds did not matter, we were all able to take a minute to stop, reflect, and build a stronger community. Leaving Jacob’s Well, we traveled to the outskirts of Nablus to the Askar Refugee Camp. Established in 1950, not only does Askar provide refuge to Palestinians who were forced to flee from the violence of the 1948 Arab-Israeli War, but it is also a center for the support and development of children. Askar’s Social Development Center helps children live in the area by organizing activities and workshops such as dance, sports, photography, and drama as well as educational support through language classes in order to provide the children with hope. While the occupation kills hopes and dreams, Askar “gives the children a right to dream and hope”. It is a place that gives hope. It is a place where women are also able to participate and help, a place that works as one community – regardless of gender or age. I thought Askar was truly an inspiring place. In a place where houses are rundown and bullet holes fill the walls, hope can still be found. The children were full of smiles and laughter and it broke my heart to know that these bright children are forced to live in such a dangerous environment. Visiting Askar and meeting all the adults and children living there taught me that even in a time where violence and war plagues the world, hope can still be found. We finished our day off by visiting a Palestinian Soap Factory located in the heart of Nablus. Before our trip here, we had heard from the group that came two years ago about how amazing the olive oil soap was and we were all very excited to visit and stock up on bars of olive oil soap. The two soap factories we visited were over 800 years old and family-run. I really enjoyed learning about the different traditional methods used to create the organic bars of soap and how the olive oil from one of the factories used only Palestinian olive oil. Although visiting and learning about the soap factories were incredible, it wouldn’t have been a proper trip to a soap factory if we didn’t buy bars and bars of soap! As we are going into our last couple of days, I have learned and experienced so much. This trip has truly been a blessing and I am excited to go back home to share all that I have learned!